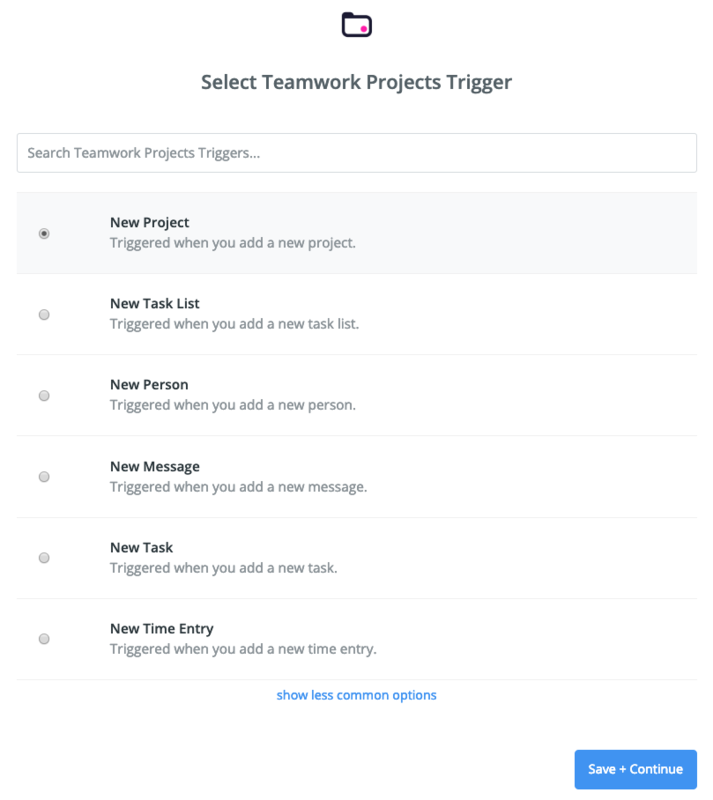 Within Teamwork Projects, you can create project items using triggers created with the Zapier integration. 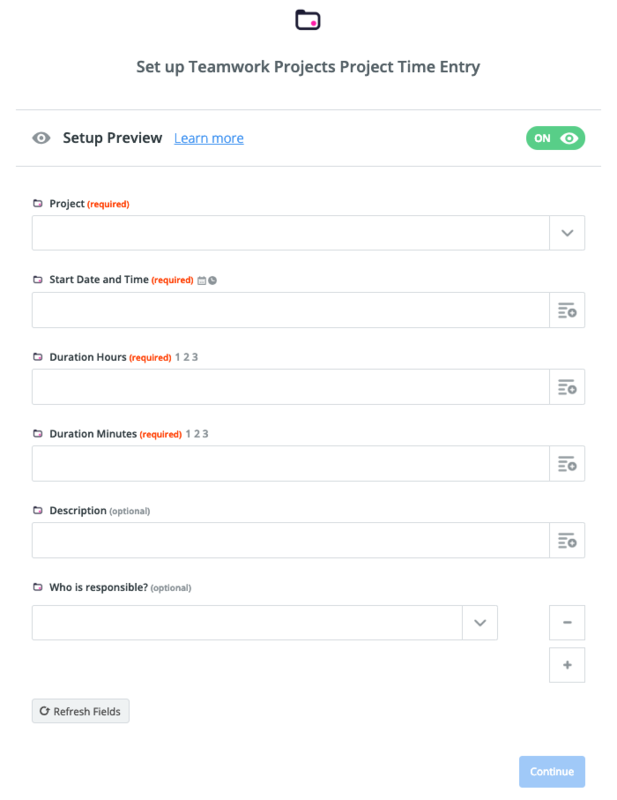 By creating zaps, when a trigger happens in one app, Zapier will automatically perform the actions specified in the other app to automate your workflow. You will first need to connect your Projects and Zapier accounts. Once you have the connection set up, go to the Zaps tab and click Make a New Zap. You will first need to choose a trigger app. Click one of your already connected apps, or search for another app using the search field at the top. Note: When creating a Zap, the trigger and action apps do not have to be the same. For example, you could set Teamwork Desk as your trigger app, and Teamwork Projects as your action app. 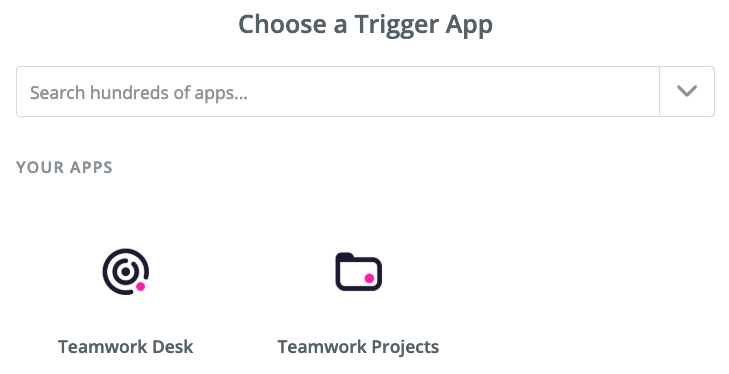 Once the trigger app is selected, you can choose which trigger you want to use. 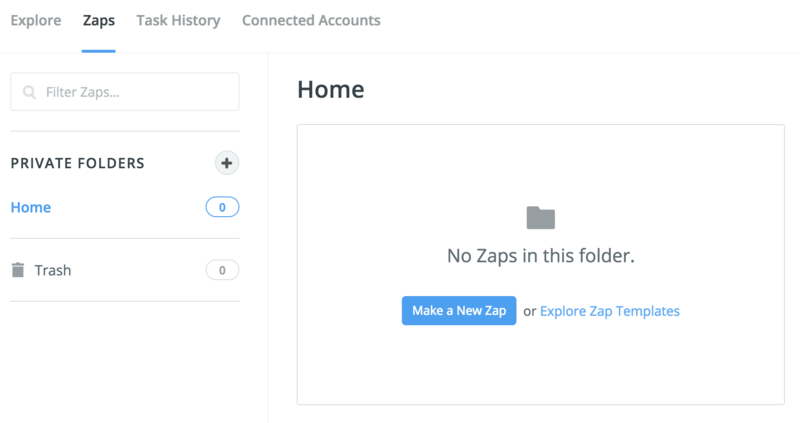 You will then need to confirm permission to connect your Projects and Zapier accounts to create the Zap. If you have more than one Projects account linked to Zapier, you can choose which one to use. The next step will be to test the connection for the trigger. If there is anything required to be already set up on your Projects site based on the trigger selected, there will be a note added. Once the test is completed successfully, you can continue to create the action for the Zap. When creating the action, you can choose Teamwork Projects again, or search for another app for your action. 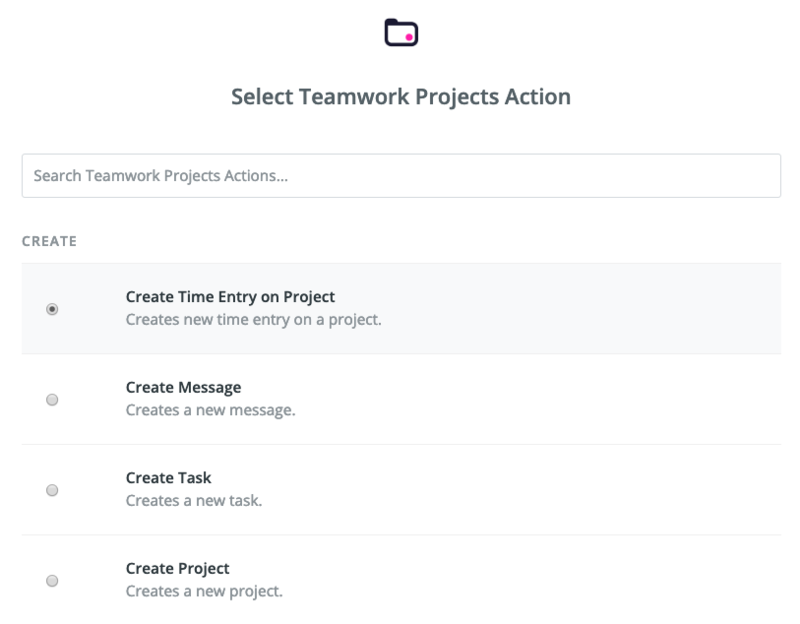 When using Teamwork Projects as the action app, you can set actions such as creating a time entry on a project, or creating a new project, message or task. As with the trigger app, you will need to select which Projects account you want to run the action on. You can then enter the properties for the action item, as well as select the project (and task list if relevant), to add the item to. Once you have entered the required details, you can review the action and also send a test to Teamwork Projects. When the setup is complete, you can name your Zap and turn it on. 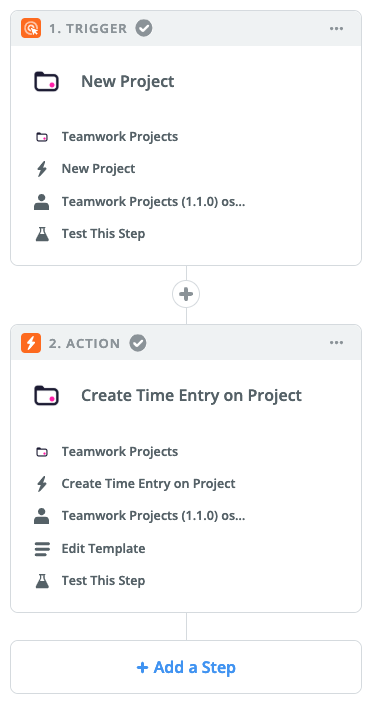 In the left side pane, you will see a timeline of the created trigger and action steps. You can also add additional steps here if you like. 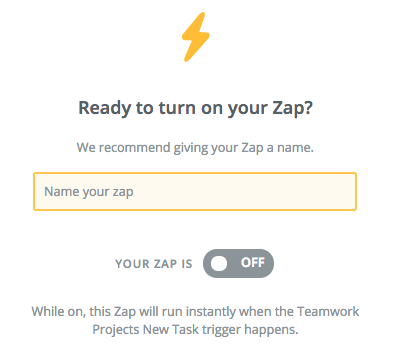 In the above example, the trigger has been set to create a task, and the action has been set to create a time entry on a project, meaning that any time a new task is created on one of your projects, the Zap will automatically create a time entry on the project selected in your action.